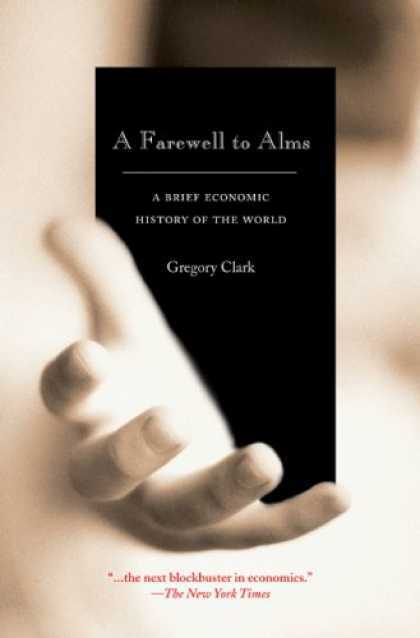 I’ve been reading Gregory Clark’s A Farewell to Alms: A Brief Economic History of the World on and off for a while. My lack of knowledge of history is embarrasing, and economic history, er, well… Anyway, I find Clark’s book interesting and want to type down a couple of comments and a few quotes. The book is divided into three parts; I’m in the middle of part two right now, so I’ll just comment on the first part now and return to subsequent parts later. Clark intend to propose answers to these questions and explain how they are connected. Since we are for the most part the decendants of the strivers of the pre-industrial world, those driven to achieve greater economic success than their peers, perhaps [my] findings reflect another cultural or biological heritage from the Malthusian era. The contented may well have lost out in the Darwinian struggle that defined the world before 1800. Those who were successful in the economy of the Malthusian ear could well have been driven by the need to have more than their peers in order to be happy. Modern man might not be designed for contentment. The envious have inherited the earth (p. 16, emphasis added). Notably, he moves from the open, inconclusive expressions ‘may well have’ and ‘could well have been’ to the closed and conclusive ‘have’ in the last sentence. Part One of A Farewell to Alms is about the Malthusian era which lasted from the dawn of man to the Industrial Revolution. In a Malthusian economy, most people’s income is at the subsistence level, and any short-run increase in living standards are soon eaten up by an increase in population. (For those interested, Thomas Malthus [1766-1834] was the first, academic economist in England, but also a minister in the Church of England.) In chapter two, Clark explains the theory of the Malthusian model. The next three chapters are devoted to empirical evidence supporting the implications from the Malthusian model, discussing living standards, fertility, and life expectancy. I must admit I found these three chapters a bit boring, but they are of course crucial in Clark’s book. At any rate, I’m somewhat convinced that before the onset of the Industrial Revolution, most societies were for the most part in the Malthusian equilibrium. In chapter six, Clark discusses the evolutionary process he claims worked on humans all the way through history until the Industrial Revolution. One can hardly argue against the evidence of ‘survival of the richest’ (p. 113); I’m less convinced of its effects. Chapter seven on technological advance is interesting. Clark discusses how economists measure advances in technology and why it makes sense. Clark has no need for ‘conformity,’ obviously, and it is liberating and refreshing. Most economic historians, he claims, share the view of Adam Smith, who explained ‘poor economic performance of the preindustrial world as a consequence of institutions that offered poor incentives’ (p. 146). The empirical evidence does not add up, however. Economic historians thus inhabit a strange netherworld. Their days are devoted to proving a vision of progress that all serious empirical studies in the field contradict. Trapped in this ever-thightening intellectual death-spiral, they can maintain the vision only though [sic] a strange intellectual dissonance, appealing to more and more elaborate conceptions of how early institutions could unwittingly have provided poor incentives (p. 147). In the last chapter of part one, chapter nine, Clark claims that people’s preferences changed under the Malthusian pressures of the pre-industrial world, and how empirical evidence supports his view. Part two of A Farewell to Alms deals with the Industrial Revolution and will be subject for discussion in a later post. Just want to give a sign of life and say that I, at least in the short term, intend to keep posting on the blog. The hiatus, which just ended, was caused by a number of things: Completing and submitting my PhD thesis; that time of year; looking after my son (maternity leave); playing chess; submitting stuff to conferences; moving to a temporary apartment; living temporary; buying a house; preparing a trial lecture and the defense of my PhD; giving the trial lecture and defending my PhD; an extraordinary snowy winter; and getting a job. With all that out of the way, I hope to be able to keep this blog alive.